Harrison Coll darts across the stage, like a pinball bounding from side to side. Or maybe he's more of a missile that's caught fire. His feet become irrelevant; every movement is just a dash, a thrust, a scream from his body. Turning, flying, launching, landing. Inside him festers volatile discharge, tainted fuel that spoils his energy to make it anxious and angst-ridden. He struggles alone in the wide, dark universe that is the Skirball. This moment situates itself in Invisible Divide -- one of four pieces presented by BalletCollective on November 4 and 5. Croll's solo proves private and powerful, but so are many of the scenes that wander in and out of Troy Schumacher's choreography for the program. In fact, something about the night feels oddly relevant, like it should be noticed. Like Schumacher, and his dancers, have something to say. BalletCollective's model is one geared toward ingenuity. 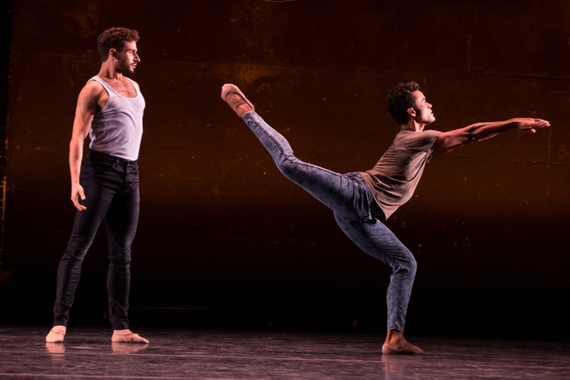 A New York City Ballet corps member, Schumacher started his troupe because he wanted a project that allowed for innovation and collaboration. Each commission is the culmination of three people's visions: a visual artist or writer provides source material, and Schumacher and a composer react to whatever it evokes for them. Thus, BalletCollective's repertory is a product of thoughtful interrogation and exploration -- philosophy physicalized. You will not find pretty ballerinas dancing to Debussy here; Schumacher's company isn't referencing the romanticism of another era. They live in the now. That's exciting in itself. What's more exciting is that they're good at it. This isn't just a noble effort to stimulate the entertainment sector. It's a successful testament to who we are as young people in the 21st century. Schumacher is only 28 years old, and most of his dancers are his age or younger. His frequent professional partner, composer Ellis Ludwig-Leone, has a hipster's panache about him, and from his photo, you'd imagine him at a coffee shop in Brooklyn. BalletCollective is a mish mosh of intelligent creators trying to figure out adulthood, and their work expresses something that a tutu will never capture, despite its glamour. All That We See opens the bill, a 2014 ensemble piece subsumed in greyness and intent upon abstraction. It's the weakest link by far, though still worthy of a single viewing. Dancers fling themselves into contorted attitudes, knees bent and twisted. Their formations -- often cube-like -- feel crushed and claustrophobic. But in one lovely, peaceful image, Meagan Mann bourrées backwards, blind behind her. She's lonely and subtle, like a specter floating. In another bold tableau, Claire Kretzschmar breaks into a Forsythe-esque solo, her long limbs soaring easily. You would think that Schumacher's movement aesthetic -- stunted, sporadic phrases juxtaposed with discrete motion -- would better suit shorter dancers, but somehow it adapts to bolster whoever uses it. Here, Kretzschmar looks expansive, like a never-ending line, a sharp arrow projectile. 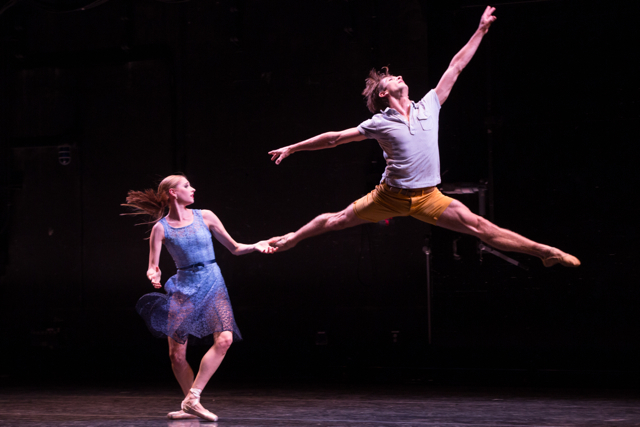 Next, Ashley Laracey and Harrison Coll share a pas de deux, Dear and Blackbirds, also from 2014. Coll wears mustard shorts and a grey tee, while Laracey is in a deep blue dress. They seem like pedestrians, in a way, as Laracey migrates along the floor, ignoring Coll while he tries to nab her attention. Brashly, he dives forward in a charge, his arms pushing outward with palms flexed. Flirting, he eventually distracts her focus, and they play together. They've fallen into puppy love. Coll imitates a boxer, jokingly throwing punches, while Laracey struts en pointe, sarcastically fanciful. They fight, too, and you get the sense that as the duet progresses, so does their connection. You note them growing up, stumbling. Love isn't so easy anymore, and neither is life. Laracey slips her hand in and out of Coll's, hesitantly, meaningfully. When he grabs her foot, just to coddle it, she slowly kicks him away. Still, they share a certain rapport. In the end, both crouch as Coll pulls Laracey's hair out of her ponytail. Their evolution feels real, organic -- like an adolescent romance matured. It makes you think that love may exist, even if in an imperfectly fragile form. Indeed, Schumacher has a certain talent for grappling with relationships, or how people empathize and interact with one another. His work feels driven by narrative, not by steps in the dance vocabulary. The latter only emerge to compliment the message he's communicating. Schumacher again displays his sensitivity for interpersonal and intrapersonal discussion in The Last Time This Ended, a premiere for David Prottas and Taylor Stanley. The score by Mark Dancigers is creeping, majestic, and fantastical; it feels textured, like if you could touch the music, it would prick you. Stanley has an undeniable star quality; he can internalize a melody and meld it with his bones, so that it's an extension of him. This skill manifests as he toys with the elasticity of Dancigers' tune. His legs and arms project horizontally, only to pull back in, like he has a demon that's trying to escape but can't. Or he wants to convey something to Prottas but can't. He's having some type of internal combat, mixed emotions that delay his proactivity. Between Prottas and Stanley lies tension, anger -- when Prottas touches Stanley, Stanley shrugs him off, as though the intimacy bothers him. They suffer from the same ghosts, a memory keeping them apart but forcing them together at the same time. As Stanley walks away, Prottas stares at him longingly. Suddenly, Stanley looks back at his companion. A reconciliation? A goodbye? The lights flash off, and you'll never know. Finally, Invisible Divide closes the night. Here, both Schumacher and Ludwig-Leone challenge the boundaries of their previous oeuvre, and the result is absolutely brilliant. Lyrics make for provocative poetry to accompany the dancers: "in my mind there is a moment/ when blue and black fade away with the night and/ the world is gilded/ in gold/ and i can see more clearly/ alone/ no longer lonely." Sung by Vanessa Upson, they chill, shooting shivers up and down your spine. Meanwhile, the ensemble in black surrounds and ignores Coll, an outsider looking in. He seems tortured, horrified by what survives inside his head. Sometimes, the corps almost embodies his wavering temperaments, but otherwise, it only emphasizes his aloneness and separation. Meanwhile, he is liberated, vulnerable, wild. His body breaks in a backbend, ribs jutting like they might rupture his skin. He's completely out of control, a loose canon. "see the space in between/ little lies/ from empty lungs/ the space in between/ you and me/ that's killing me." Invisible Divide is a force. It's a force, and it's meaningful, and it gets it. It gets the things that so many millennials have failed to put into words. It's like how your favorite band made you feel as a preteen, but for adults. Like you're understood by someone. By Schumacher. By Ludwig-Leone. By Upson's pinching moans, and by Coll's jutting eyes. 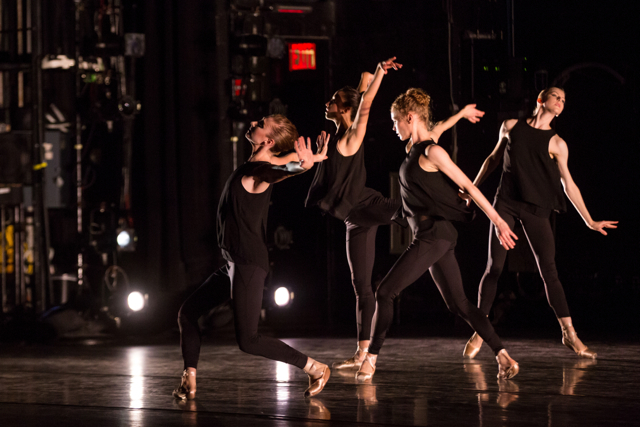 The Skirball performances prove that BalletCollective has purpose. It's novel and motivated; with so much talent and capacity at its fingertips, you might find it fun to daydream of all the places it could go next. Interestingly, the audience was the youngest I've seen at a dance event in ages, save at The Nutcracker. That's because Schumacher's ballet makes you feel like you're washing yourself clean -- you see your mind onstage, your mind, and you scrub its crevasses to find what lies inside. This is BalletCollective's strength: it shows everything ballet could mean, if you let it.